Sony has announced two new Handycam camcorders, with the DCR-SX15E and DCR-SR15E offering a choice between flash memory or hard disk. Both the DCR-SX15E and DCR-SR15E Handyscams offer 50X optical zoom, SteadyShot image stabilisation and Face Detection. "Light, compact and easy to use, the Handycam DCR-SX15E shoots crisp, clear video and stereo sound onto removable flash memory," says Sony's release. "Just slip in a Memory Stick or SD card (not supplied) and capture the moment for easy transfer to your PC after shooting." "If you're looking for extra-long recording times, the Handycam DCR-SR15E stores up to 61 hours of Standard Definition video on its 80GB built-in hard disk drive," Sony adds. "With no need to carry spare tapes or discs, there's plenty of space for a long weekend of non-stop shooting." Both camcorders have a joystick operated menu system and 2.7-inch LCD screen, as well as a built-in video light and boasting Direct Copy for PC-free transfers of the footage. 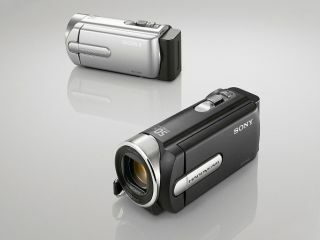 Both the DCR-SX15E and DCR-SR15E Sony Handycams have been given a UK release date of October 2010.